Northern lights, over the Copper River, and Mount Sanford, Mount Drum and Mount Wrangell, Wrangell – St. Elias National Park and Preserve, Alaska. Please click on the image above to view a larger version of this photo. Part 3 of my complete guide on aurora borealis photography. So far, on Page 1, we’ve covered the initial stuff. Finding the aurora borealis, scouting your locations during the day to find potential composition sites, what clothes you need to keep warm and comfortable, the importance of bringing along a good headlamp. Page 2 addresses the question of what camera gear you need when photographing the northern lights, and what camera settings are most useful. Page 2 also covers a broader range of issues you’re likely to run into, like how to find critical focus in the dark northern sky. 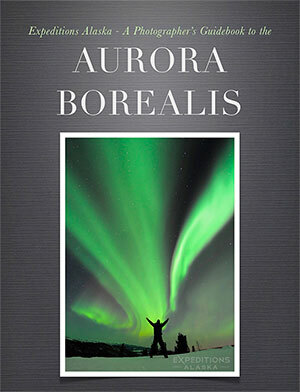 Page 3, to wrap things up, begins with some thoughts on composing your aurora borealis photos. The basic guidelines for strong composition for aurora borealis photography are no different to any other art form. But the elements you work with, and the conditions you photograph in, will present some challenging options. Here are a few thoughts on how to deal with some of those challenges. As always, the standard caveats apply. Include something in the foreground. The most stupefying aurora borealis display can be a great photo subject by itself, but it’ll almost always benefit by including something else in the photo. Do not include a foreground subject; abstracts can be great (see what I mean about caveats?). Experiment; shoot a longer lens. A longer exposure. A person in the foreground. Try zooming your lens during the exposure. Try moving the lens. Try using your headlamp to “paint” the foreground. Try using your vehicle’s headlights to really get whacky with it. Avoid cloud cover; the idea situation is a clear night sky. Watch cloud movement and be prepared to move. I’ve packed up and driven 100 miles in the middle of the night to avoid a fast moving curtain of low cloud. Use clouds to your advantage, and try a composition that includes them. Use available local knowledge. Call your friends across the state/region and ask what the sky looks like there. If the forecast looks good (i.e., clear) to the east of you, and bad to the west, drive east. Be patient. Doug, pictured lying prone on the Glenn Highway in the photo on page 1, came up here for a week, covered countless miles on foot, on the road, and in a bush plane, only to turn around and head back out the night his trip ended to photograph the aurora borealis. After getting up that morning at 5:30am, spending all day looking for photo subjects, returning to town in the evening, we then spent the night back out in the Chugach mountains hoping for the Aurora; this display came on around 2:00am and lasted maybe 20 minutes. We waited another 2 hours, and then drove back to town, 2 1/2 more hours, for 20 minutes of aurora borealis photography. A 26 hour day. Doug’s patient. Be willing to travel. You might have to drive 100 miles to get optimal conditions. That’s a better decision than sitting in your car, sipping coffee and listening to your iPod, wishing you were somewhere with a cloudless night sky. It’s your photo, not mine. So shoot it however you want to. That’s the nuts and bolts stuff, but most of that is pretty straightforward, and not surprising. Here are some tips I might offer so you don’t waste the amount of time and energy that I have because I didn’t know better at the time. Some tips are repeated from above, but repetition is reinforcement. (Key, if something is mentioned above, and repeated here, it’s possibly something you might want to closely consider). When not shooting, keep your camera lens cap on, and/or point the lens down, to avoid frost collecting on the glass; a lens hood helps. Don’t ask how I know this. Carry a cloth to clean your lens in your pocket for those times you forget tip #1 above. Do not set up where your camera lights, or headlamp, will interfere w/ other photographers’ shots. If someone else does this to you, pull out your bear spray. Don’t keep bear spray in the trunk of your car, it’ll freeze, and be no use to you. A cable release, rather than wireless; it’s nighttime, and if you want to do exposures longer than 30 seconds, you’ll need that cable release. Be careful with it when it freezes solid. Keep your shutter speed as low as possible, in general. But experiment. Do not breathe. Everything fogs up and the aurora will almost certainly disappear. 🙂 Seriously, don’t breathe on your lens. Don’t just guess; know your subject. Learn something about the aurora, the night sky, winter landscapes, and cold air. Watch forecasts (see “Resources“ at the end of this article). Use 2 cameras and give it your best, with a 2 tripod set up, each w/ different focal lengths or diff shutter speed, compositions (maybe vertical/horizontal), etc. Don’t bother with a 3 camera setup. Crank up iso, turn off your NR, make some ‘verify’ shots first; sharp focused images are great, eh? Practice, practice and practice. When the aurora borealis fires up, don’t waste your time figuring how to screw in Nikon’s riduclous &#^$%@* screw-in cable release. Know how to use your camera, and how to adjust these settings. Standing on the snow at minus30 deg F in the dark is not the time to figure out how to change your image quality setting from jpeg to RAW. Know how to change your ISO, adjust exposures, re-situate your camera, etc. The aurora borealis, in all its silent ghostly beauty, doesn’t wait for you to find your RGB histogram. Be warm; cold is a distraction that you don’t want. Humankind evolved on the Grasslands of sub-Saharan Africa, not the polar subarctic regions. So pack those woolies. Know your subject; if there’s a good aurora borealis display tonight, there’s an excellent chance it’ll be out again tomorrow and/or the following night. Know your subject; the sun, seen from earth, effectively revolves every 28 days or so. This means a good aurora borealis showing may well yield another strong aurora 27-28 days later. Mark the date, watch the weather and make plans. Though I’ve seen the aurora right at sunset, and right before the dawn, the lights are generally most active b/n 10pm and 2am. Stay awake at night. I’ve never had much luck trying to sleep and awaken throughout the night and check to see if anything’s happening. Either I sleep through it, or I wake up, see the sky lit up like Krakatoa just exploded, and then spend so much time getting all my warm winter clothes on, my camera gear aligned, etc, that I miss the action. Regardless how fast you are, it WILL take 20 minutes to get outside, appropriately dressed. The aurora borealis can turn itself off faster than a light switch, so don’t dally. Get your rest during the day. Northern lights over the Mentasta Mountains, tundra, boreal forest and a small kettle pond on a moonlit night. Wrangell – St. Elias National Park and Preserve, Alaska. Click the thumbnail to view a larger version of this photo. Use the clouds to strengthen the photo. Here are a few more topics that I’m somewhat ambivalent about; but considerations you’ll likely have to deal with. Moonlight: A full moon, or nearly full moon, can be fantastic for providing ambient light to match the aurora, lighting the foreground and allowing faster shutter speeds. Conversely, a bright moon will lower the sky/aurora borealis contrast, and your photo can lose some detail. Silhouettes of trees, mountains, etc, can be a great subject to compliment the aurora borealis. I have no preference of a moonlit night or a darker night. I just dig seeing the aurora either way. Natural foregrounds: some folks don’t like shooting the aurora with any kind “manmade” stuff included. Though I tend to mostly avoid the “hand of man” in my nature photography, I’m open to including whatever elements work well for a photo. Either way is fine, with me. Doug got this killer photo with the highway under the aurora borealis. If it works, shoot it. If it doesn’t, either shoot it anyway, or move. You’ll find all you want to know and a whole lot more via the following websites and links. The signups and alerts are a nice tool. “the nation’s official source of space weather alerts, watches and warnings. SWPC provides real-time monitoring and forecasting of solar and geophysical events which impact satellites, power grids, communications, navigation, and many other technological systems”. 3 Day Forecasts here (i.e., check THAT page). Great for forecasts out a few days or so, and not just in Alaska, but all across the polar circle. An immeasurable resource for learning all things aurora, as well as receiving forecasts and predictions. And here is a great page with info on exactly what the aurora is and the different auroral forms we see: homogenous arcs, rayed arcs, active aurora, rising vapor column and the corona. They have a great FAQ page with info here. Another good site for following aurora stuff – they also have an Alert service, and can send you an alert by phone and/or email. They also have a host of information concerning sun spots, leonid meteor showers, and so on. Also, this is a general “space weather” website with tons of pertinent info for not just, aurora borealis photography, but anything solar related. The Solar and Heliospheric Observatory. A joint project between NASA and Space for Europe (ESA) “to study the Sun from its deep core to the outer corona and the solar wind.” The observatory was launched in 1995, and slowly moves around the sun, w/ fancy instruments that measure all kinds of crazy stuff. SOHO was designed to answer these 3 questions: “What is the structure and dynamics of the solar interior? Why does the solar corona exist and how is it heated to the extremely high temperature of about 1 000 000°C? Where is the solar wind produced and how is it accelerated?”; SOHO is also now the most prolific discoverer of comets in history, so it’s worth paying attention to, for solar buffs. A handy way to receive alerts on twitter. Follow Aurora_Alerts. Like Expeditions Alaska on Facebook to stay in touch. So, remember all that stuff, and give it a try. And pray for luck. Before you go, remember to visit the Northern Lights Photos gallery. The aurora borealis (northern lights) light up the night sky above a tent. Campsite in the Mentasta Mountains, boreal forest, Wrangell – St. Elias National Park and Preserve, Alaska. A full moon lights up the landscape, in full fall color glory, and the aurora borealis lights up the september sky in Alaska. Compare the ambient light in this picture with the one on the left here. PS: I have now edited a copy of this entire 3-part article updated it, added a ton more photos, and generally made it way cooler, PLUS made it available as a free downloadable eBook. It’s not a ‘pretty’ site, by any stretch of the imagination – but it has great short term forecasts (< 1 hour forecasts, and sometimes as short as 8 or 12 minutes – great for warnings of approaching bursts of activity when you are in the field and also have cell reception with internet). What about bears? are they a problem? Thanks Dave … speaking of which, last night was good, but I wasn’t out. Could be some good activity in the next couple of nights, too, they say. Very rarely; generally they’ll be hibernating when the aurora is out. Not always though, as you can see from the pics above, in the fall bears could well be around. They’re not likely to bother you though. If they might be an issue, make noise, go with a group, and be vigilant. And carry bear spray, which I do anytime I’m out during bear season up here.